Matchy-matchy has always been okay in my book, especially when it comes to prints. I am loving all of the hook-ups that I am seeing this season such as this top back to these pants, this tweed jacket back to this skirt and this stripe top back to this midi skirt. Don’t be afraid to make it match! I can’t shy away from polka dots and I am already dreaming up a million ways to wear these polka dot trousers – back to a stripe tee, bright, chunky sweater, or even with a checked, oversized coat. You can shop this full look below and ALL my favorite accessories from Ann Taylor (I’m sorry these velvet bows and this pearl piece are too cute)! Thank you to ShopStyle and Ann Taylor for sponsoring this post. 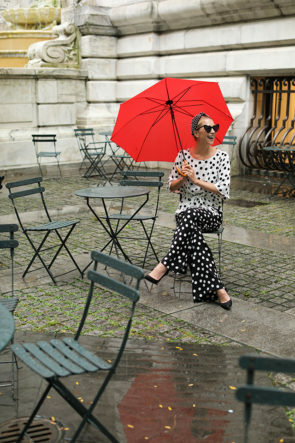 Pants: Ann Taylor (also love this polka dot skirt here and dress here). Tie Top: Ann Taylor. Suede Shoes: Ann Taylor (also love these cap toe boots). The post MAKE IT MATCH // POLKA DOT ON POLKA DOT appeared first on Atlantic-Pacific.